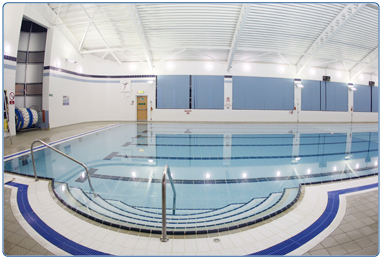 Whether you want to lane swim on your lunch break to stay fit, take your kids for a fun splash, or you just fancy a quick dip, South Lanarkshire Lifestyle's 25 metre swimming pool provides a safe, spacious swimming environment for you. If you want to take young children swimming, the pool has an adjustable floor which is ideal for this purpose. The kids can also have fun at our pool fun sessions on Saturdays from 2.00pm-3.30pm and Sundays from 10.00am-11.00am. For child safety, please ensure you comply with our under 8's swimming policy when bringing young children to swim. Group and private swimming lessons are also available offer to suit all abilities from pre school beginners to adults. For more information on these lessons, visit our Swimming Development section. For more information about what is happening in South Lanarkshire Lifestyle Eastfield's pool and when, call 0141 642 9500. For information on our membership packages, visit our Membership homepage. To discover what this swimming pool has to offer you, visit the Pool timetable.